It had been hoped that last month's base rate rise would propel providers into action, yet things haven't (yet) worked out quite that well for savers. 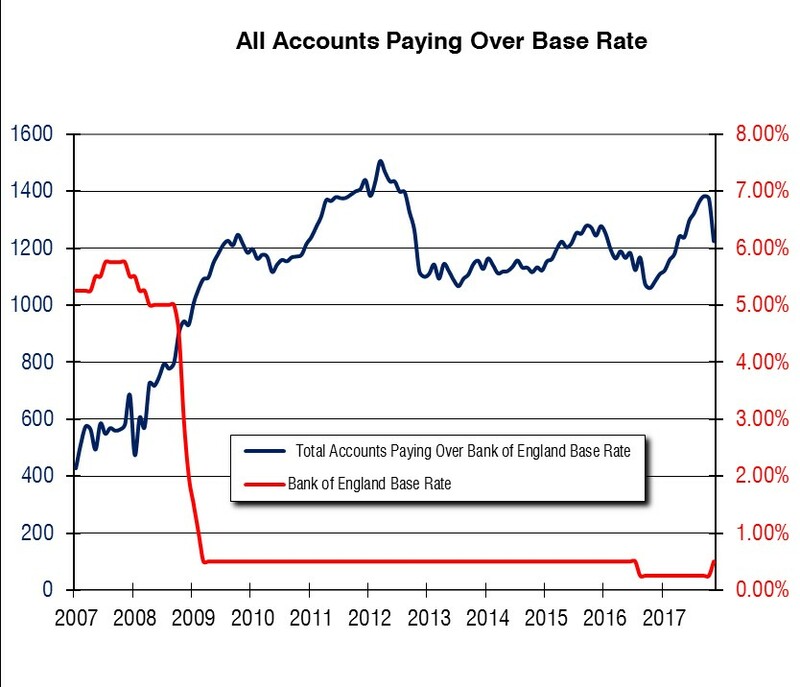 Indeed, far from improving things, data from the latest Moneyfacts UK Savings Trends Treasury Report reveals that the number of accounts paying over base rate has actually fallen by 150 in the last month - the biggest drop in almost a decade. The figures revealed that a total of 1,224 savings accounts currently pay more than base rate, down from 1,374 last month, marking the largest monthly fall since February 2008. This also means that just 69.90% of all accounts now pay more than base rate, down 7.64% and the first time the percentage of the market has fallen below 70% since January 2013 (68.28%). Granted, base rate may have risen to 0.50%, but savers have no doubt hoped that providers would have followed suit by raising their own rates. The fact that fewer now pay above base rate than last month shows that not everyone has done so, "proving that many providers have failed to pass on the full rate rise to their products", said Charlotte Nelson, finance expert at Moneyfacts. Despite this, variable savings rates have increased - albeit not by the full 0.25% base rate rise - marking the first time since April 2012 that all variable rates have risen. The average no-notice rate has risen by 0.06% to stand at 0.45%, the highest average easy access rate seen since September 2016, while the no-notice ISA rate has seen the same 0.06% increase to a 12-month high of 0.68%. The notice sector has seen even greater rate rises, with the non-ISA rate up by 0.08% to a 16-month high of 0.74%, while the notice ISA rate has risen by 0.09% to 0.89%, the highest recorded since October 2016 (0.92%). However, "while rates increasing can only be seen as positive, the averages have yet to return to pre-August 2016 levels," said Charlotte. Furthermore, thanks to various Government interventions that have given providers access to cheap funding, "it's likely these low rates from the main banks will be around for some time, [as] these providers still do not want savers' funds. It will take a lot more than a 0.25% rise to see them compete for the Best Buys again. "Savers will now have to take matters into their own hands and re-evaluate their accounts to make sure they are not on a rate that pays less than the base rate. If they are, voting with their feet is their only option." Don't put up with poor rates. Use our savings search tool or check out the Best Buys to find the best savings rate available, and make sure you've got one that pays above base rate.